Sony KDL-46HX753 review | What Hi-Fi? 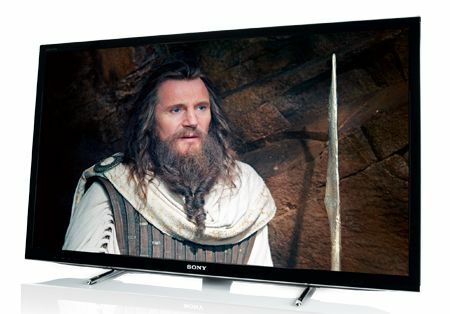 There really is no arguing with Sony’s pricing policy for its 2012 range of TVs – take this Sony KDL-46HX753, for example. Here’s a handsome, nicely made and beautifully finished 3D TV with a minimal stand, extensive online functionality, integrated wi-fi and Freeview HD reception, all for under £1200. It only takes a moment’s search-engine investigation to find it for close to a grand. On paper it looks great value. And the really good news is that it still looks great value after a thorough investigation of its abilities. You can always rely on Sony equipment to make good sense where ergonomics are concerned, and the KDL-46HX753 is no exception. The remote control isn’t the flashest but it’s well laid out and feels good in the hand, and the on-screen menus are crisp, clear and entirely logical – for a while there it seemed Sony’s Xross Media Bar menus were going to collapse under the weight they were asked to support, but some cunning reworking means they’re still as legible and useable as any rivals’. Specification is more than adequate: the Freeview HD tuner and Sony’s Entertainment Network means there’s plenty of choice where free content is concerned. Backlighting is via edge-arrayed LED, and the Sony can either sit upright or lean back a bit on its stand for ultimate positioning flexibility. Up and running, the Sony KDL-46HX753 follows the very agreeable template set by the other Sony screens we’ve seen so far this year. Given a Blu-ray copy of Gran Torino to deal with, the KDL-HX753 is a balanced and convincing watch, with deep, even and detail black tones able to comfortably co-exist with clean, equally detailed (if not the outright punchiest) white shades. The colour palette tends towards the green/yellow straight from the box, but is easily finessed into something altogether more natural – and then, while it lacks some of the supernatural subtlety and nuance of the pricier Sony KDL-46HX853, the HX753 is nonetheless an unarguably lifelike watch. Clint Eastwood’s craggy skin-texture and weathered skin-tones are both entirely convincing. And motion (once the Sony’s ‘Motionflow’ processing is set to its least intrusive) is handled with the sort of matter-of-fact efficiency that makes you forget there’s any processing going on at all. High-definition TV pictures are equally enjoyable, if understandably a little lighter on fine detail. This is a splendid television, with talent in every area – only the relative lack of dynamism to contrasts (a by-product of the shortage of out-and-out punch to the otherwise-exemplary delivery of white tones) prevents the Sony KDL-46HX753 from leading the field. Like the pricier Sony KDL-46HX853, the HX753 doesn’t cover itself with glory when asked to upscale DVD images. It’s not quite as ruthless as its more expensive sibling, but there’s still more picture noise, uncertainty with movement, and jagged edge definition than is really acceptable – certainly any of Sony’s 2012 range of Blu-ray players will do a better job for you. That’s really as far as it goes where picture-quality gripes are concerned. The KDL-46HX753 is a tremendous 3D TV – you wouldn’t know that from the off, of course, because one of the reasons it looks such great in-store value is its complete lack of 3D glasses. But bite the bullet and buy a pair or two of Sony’s (rather clunky) 3D spectacles, fire up a copy of Alice In Wonderland and this set rewards in spades. For an active-shutter design, it’s commendably short on cross-talk or shimmer – and its 3D pictures are bright, stable and lavishly detailed. Depth of field is excellent, movement is secure – and this is equally true of 3D games, even though the Sony’s minimal response times result from the bypassing of its motion processing algorithms. In fact, the only area where the KDL-46HX753 is anything other than entirely commendable is sound. Even though the KDL-46HX853, with its speaker-bearing plinth, has set a high audio bar, we know from bitter experience that flatscreen TVs tend to sound pretty humdrum. Even so, the HX753 is a thin, undynamic listen with scant personality and no real drive to speak of. So, as we never tire of saying, be prepared to spend some money if you want movie sound to match the quality of your movie pictures. To criticise a flatscreen for the poverty of its sound is rather like objecting to a tiger on the basis of its stripes, though – that’s just how things are. Realists will accept the Sony KDL-46HX753 for what it is: a frankly outstanding television at the price.